Blackhall Athletic’s spirited performance was not enough to stop them from being beaten 6-1 away to Oxgangs, a scoreline that flattered the home side. Blackhall had many absentees, and were able to bring in a trialist, Jonah, for the game. Jamie Campbell was named captain again and the team lined up in a new 3-5-2 formation. The game got off to a lively start, and after just a minute the ball was hoofed up towards Oxgangs number 11 Didi Dublin-Green who had acres of space on the wing, he cut inside but Thomas Palmer was able to clear the ball away for a corner. From the corner number 22 Stuart Dobson headed harmlessly over the bar. Blackhall were then gifted a free kick after a daft foul from the Oxgangs defender. The ball was floated in towards Jamie, who brought the ball down well, turned and blasted a shot which crashed off the post and was then cleared away to safety. Oxgangs were attacking again, but Michael made an important challenge to avert the threat for the moment, the ball was picked up by number 10 Ahmed Ahmed, and his low, driven shot forced a good stop from Finn who had to get down to push the ball out for a corner. Oxgangs broke the deadlock from the set piece, when the tame ball in seemed to bobble beyond everyone, somehow finding its way in after going through a mob of players in the box, making it 1-0 to the home side. Oxgangs pumped another long ball forward but Thomas Palmer was able to clear it easily, Gregor Rolland then made a brilliant sliding interception from a low cross to prevent another chance for the hosts. Blackhall finally got forward and were gifted a corner out of nothing, from which Nathan Gallagher rose highest and his header darted just wide of the goal. Nathan then hammered a free kick from range which the keeper should have dealt with easily, but instead he sliced the ball away and let the defenders clear it, Oxgangs lumped it forward again and Blackhall were exposed at the back, but the Nathan did his bit defensively and made a brilliant challenge to deny a clear goal scoring opportunity and keep the score at just 1-0. Jonah was then handed his debut off the bench, being brought on for Khadime, which meant that Michael would move to Khadime’s left wing position and Jonah would slot in at centre back. Joseph also came on, for Fallilou. Finn then made what was undoubtedly the save of the game, the ball was zipped into Ahmed Ahmed, the chance looked easier to score than miss, he had half the goal gaping and tapped his shot goal bound, but Finn flew through the air to make a show stopping save, and keep Blackhall in the game. Blackhall then levelled the scores, with both substitutes having a large part to play in the goal. Jonah linked up well with Joseph who then elegantly put Brandon clean through, and the striker cut onto his left foot and unleashed a venomous shot beyond the helpless Oxgangs keeper to make it 1-1 just before the end of the half. Nathan then made yet another brilliant sliding challenge to prevent the opposition from getting forward right at the death of the first forty five. Substitutions were made at the beginning of the second half, Zane came off for Fallilou, which meant that Nathan Gallagher would move to striker, and Fallilou to right wing. Oxgangs set the pace early on, Didi Dublin-Green headed a cross on to Ahmed Ahmed who nodded against the bar. Blackhall were still left shaking by the early shock and Ahmed had another chance which was comfortably collected by Finn. 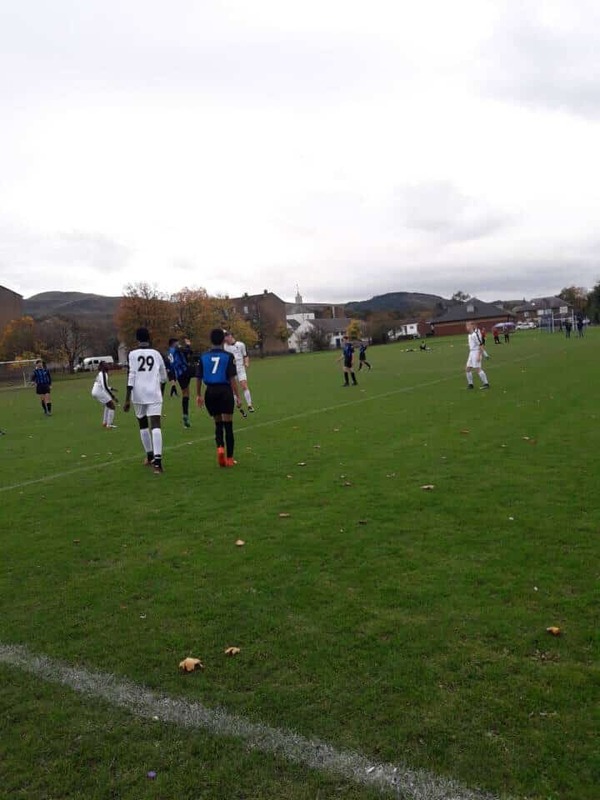 Ahmed then scored a goal of the season contender when the ball bounced in front of him around 20 yards out, he struck the ball clean as a whistle with the outside of his boot and put Oxgangs back ahead. Didi then passed up a guilt edged opportunity to make it 3-1 when he skewed his header wide. The hosts continually took the ball down the left side and forced a corner after a hopeful cross was blocked. The ball was whipped in to the far post, Didi’s header was denied by the post, but the rebound fell to Stuart Dobson who theatrically back heeled the ball in to give Oxgangs a two goal cushion. Jamie Campbell then tried a pot shot from far out, but the ball dribbled wide. Blackhall could have been 4-1 down when number 17 Joe McGowan hit a hopeful half volley which forced Finn into yet another good save. Blackhall then did find themselves 4-1 down when Didi was played through again, and he calmly slotted the ball beyond Finn who could do nothing to stop the shot. Khadime was then brought back on, replacing Joseph, who was only off for a matter of seconds before he had to come on for Jamie who had received a horror injury after being hit with a high boot. Ahmed Ahmed then topped off a fine performance with another exquisite goal, he was played into the clear and thumped the ball into the back of the net to pile more misery on the away side. 5-1 then swiftly became 6-1 when Didi latched on to a good through ball and poked it into the goal with just a few minutes to go. Blackhall did have a chance to grab one back when Craig picked out Michael with a breathtaking lofted pass, and the Blackhall number six dinked the ball agonisingly over the bar. Blackhall did have one final chance when a free kick was fired into the box, but Zane headed the ball just off target. The header was the last kick of the game and the referee called time on an entertaining game which finished 6-1 to the hosts.